I am just starting this topic to prove to atarilovesyou (funny name for such a massive NES fan ) that the Sega Master System beat the NES with ease outside the markets of North America and Japan. As we know in other markets Nintendo couldn't enforce their unfair market tactics (which were illegal) and so had to fight on a level playing field against the SMS and Atari consoles. Nintendo only shipped 8.56m NES consoles in non-Americas & Japan regions. That figure has been topped by both SNES and Wii in Others as well as Nintendos portables and numerous platforms from rival companies. Thats shipped and not sold and taking into account how large an area that covers that just shows how poor sales figures were in other regions versus North America and Japan. The widely quoted official sales figure for the SMS worldwide is 13 million but does not include the Majesco or Tectoy produced models which were sold in Europe and South America. Without them this leaves a figure of 11.5 million which includes Japan where I believe they a superior version of the SMS with a different name anyway. Its also worth noting that the NES did very well in other parts of Asia which is quoted within the 8.56 million figure. I know that in the UK and Europe the SMS was supported up until 1996, the NES had been dropped many years before. I myself worked for Game in the UK during 1993/1994 and we were still selling a ton of SMS systems and games but no longer sold the NES. Edited by The_Laird, Sun Jul 25, 2010 10:30 AM. Couldn't believe the explosion of games coming out in Europe for the SMS! While still nowhere near the library of the NES - I remember thinking there was a much better selection of great originals, ports and arcade games compared to crap being released en masse for the NES here in the States. In the mid 90's, I wouldn't have dreamt of paying $50+ea for 'em however, but to a culture that was still enjoying their SMS's, those would have been great times indeed! You only have to read the book Game Over, which is a pretty accurate book acknowledged by Hiroshi Yamauchi, Miyamoto, Howard Lincoln and many more from the Nintendo stable, where it states that by 1992, Nintendo only sold approx 3.5 million NESs in Europe. You can also read in that same book that Nintendo always over exaggerated their sales figures, so in reality it is probably much less. Edited by high voltage, Sun Jul 25, 2010 3:28 PM. Thankyou for that, proves my point. I really need to read that book. When I was on Sega 8bit site, someone there said the SMS was more popular in Brazil than the NES. As I already said the SMS was massive in South America and vastly outsold the NES and lasted well into the late nineties there! I believe Master System was indeed the master system in Brazil (same with Genesis). I guess the Brazilians weren't deluded by the "Now you're playing with power!" farce. 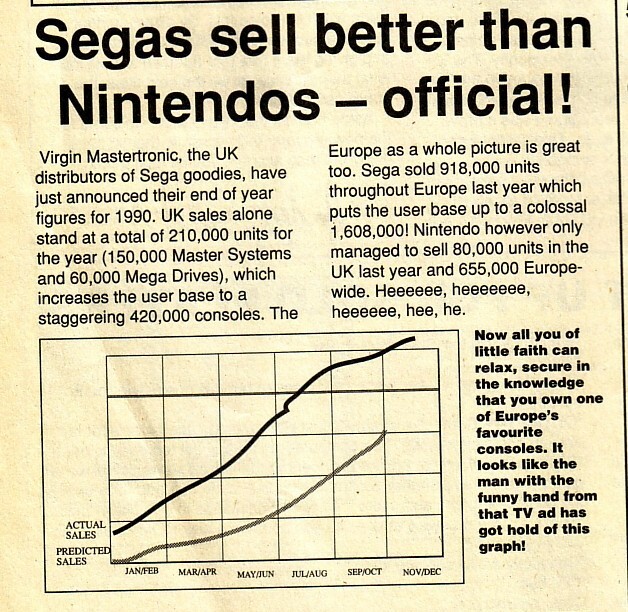 I happened to be reading about the Master System on Wikipedia (I know, I know, I don't really trust it as the final word either), and it also confirms the premise that Nintendo manipulated the market, and that it had a significant impact on Segas success. I also recommend that anyone interested in the kinds of things Nintendo did read "Game Over". Sega sold more Master systems in the US than they expected to so I can't consider it a failure. In Europe, Nintendo had to port some SMS games to try and generate sales. (Afterburner, Shinobi, Fantasy Zone) It was the complete opposite of what happened here in the US. I've been importing SMS games from Europe and Australia for 15 years. There are some really great titles and arcade ports as well as it's share of stinkers. None of those came out in Europe. In Europe, Nintendo had to port some SMS games to try and generate sales. (Afterburner, Shinobi, Fantasy Zone) It was the complete opposite of what happened here in the US. None of those SEGA games were ported by Nintendo either. They were published by Tengen in the US, and were mostly designed in Japan by companies like Sanritsu and Sunsoft (some of these don't have credits, so information on who designed some of them can be hard to find). Third parties like Takara and Sunsoft published SEGA licensed Famicom games in Japan, as well. Some of these are different than their US counterparts. The JP counterpart of Fantasy Zone is a different port and the JP After Burner is a more polished version apparently using the same engine as the US version. I have some EU imports. I agree there are some good ones (Bubble Bobble, Land of Illusion, Gain Ground, Marble Madness, and Asterix are all good stuff), though I have been being careful to avoid the stinkers. I bought an EU Sonic since it's exactly the same as it's US counterpart and much cheaper. There's also Captain Silver which was paired down for US release to the point of being incredibly short and easy. The EU version is much better with longer levels, more enemies, and bosses. Edited by BrianC, Mon Jul 26, 2010 10:52 AM. Can anyone explain why the SMS was as popular as it was despite the Genny/Mega Drive being available? Was it an installed user base early on type of thing or what? I know from being really close to both the PAL and NTSC Amiga scene, Europeans seemed to take a very conservative approach to gaming and computing. If it was cheap, it sold and people seem to have more loyalty and recognized the initial value or investment of their purchases vs. the contrast with most Americans who are of the disposable mindset. Something new comes out, we often literally "throw away" the old to make room for the new. Pretty sad, but historically it's true. And was there a huge price difference between the systems in Europe and South America? Here in the States, the Genesis was $189 at rollout and kind of hovered around the $119 mark for a long time after that IIRC. Master System, with the gun, two controllers and a couple of games rolled out at around $99-$119, dropped to $79 pretty quick and by the time the SMS II came out, that puppy was $60 and then $30 real quick at places like Kay*Bee and some music stores. Looking through the catalogues of European SMS games in the early to mid 90's, I saw NO titles under $40. They were all $40-$60. Was that just a goofy American<>European exchange rate blip or were SMS games relatively expensive over there as well? I just find it difficult, but kinda cool to believe that people would spend as much on a SMS title in the early to mid 90's as they could get a Megadrive, Super Famicom cartridge or whatever else was out and popular at the time. Must just be the way it is over there and has always explained why the Atari ST, Amiga and C64 (among others) platforms hung in for much longer than they did in the States. Edited by save2600, Mon Jul 26, 2010 11:05 AM. The Master System already had a decent user base when the Megadrive came along but continued to sell because it was half the price of the MD, I can clearly remember a time when the MD was £129.99 with Sonic and the SMS was £59.99 with Alex Kidd built in. Once the MD was released here the SMS became the budget console of choice replacing the 2600 which had sold really well up until the early 90's as a budget machine. Sega were also very clever by trying to release alot of the Megadrive's best games on the Master System too with stuff like Sonic, Streets Of Rage, Gain Ground, Shadow Dancer, Chakan etc. Which meant those who really wanted a MD but couldn't afford one just got a SMS instead. The British public are very loyal to their machines and usually always upgrade to the same company, in the case of the Spectrum which outsold everything else at one time by as much as 8:1 alot of those users got the ST. In fact every Spectrum owner I knew upgraded to the ST as a home computer because the Amiga was made by Commodore. Amstrad really missed a trick when they bought Sinclair by not going forward with the Loki project (which became the unreleased Konix Multisystem) as a next gen system with a Sinclair badge would have sold millions on name alone. Much like how the PS2 continues to sell and be supported despite the existence of the PS3, XBOX360, etc. What kind of professional magazine writes "Heeeeee, heeeeeee, heeeeee, hee, he." ??? I've also wonder how much support Sega received for the Master System in UK/EU, on the basis of Nintendo's system being the favorite child of the US game systems. Edited by malducci, Mon Jul 26, 2010 2:21 PM. SMS games where also cheaper than NES games, many titles, as already stated 29.99 GBP, NES games were like 50.00 GBP and up. Later, when NES was discounted to 49.99 GBP, Star Wars was still 69.99 GBP. Yeah, sure, parents buy that for the kids for Chrissy. Also, during the late 80s, ST and Amiga ruled in UK and Germany, nobody wanted to go back to 8-bit gaming consoles at those prices. SMS yes, possibility, but NES, with bad graphics, no way. Games for the ST/Amiga came out on a weekly basis for affordable prices from many UK based software houses. Actually, many of those software houses were also able to support the SMS, whilst the NES, they could not, due to Nintendo's license restrictions. Many were wondering why USA was so (NES mad), even in Computer Gaming World (US computer magazine) NES games were never reviewed favorably, actually the console section in CGW didn't last long at all, and they continued to review more 'in-depth' games for PCs, Amiga, Apple ][. Edited by high voltage, Mon Jul 26, 2010 2:45 PM. Are you talking about 3rd party support? The Master System was supported by Core Design, Domark, Tengen, Virgin, Codemasters, Bullfrog, US Gold, Epyx, Gremlin, Acclaim, Psygnosis and thats the people that sprung to mind first I am sure there were many more. I think Sega just made a more serious effort there, while Nintendo ignored it until it was too late. Likewise, when Sega realized they had lost North America, they shifted focus and didn't release as many games here as they could have. I think it was low hanging fruit for both companies. Until they grew, Nintendo probably didn't have the ability to market effectively everywhere at once, so they emphasized North America. Same situation for Sega, so they focused on Europe and South America. I do think Sega did well enough with the SMS in North America that they kept themselves respectable, unlike Atari. The Genesis had the chance to succeed because early adopters trusted it would get decent support. That was my feeling about it anyway. I was a NES owner, and the SNES wasn't out yet, but I figured even if Sega ended up "losing" to Nintendo, I'd still get plenty of good games from Sega regardless. As reality unfolded, the Genesis ended up very successful, on par or a bit ahead of the SNES through the years that mattered. If it were the Atari Genesis, it would have bombed on the brand name alone. Interesting post but fact tells us that the 7800 actually outsold the SMS in the US, which as much as I love the 7800 still surprises me! Probably due to brand familiarity. That being said, am I the only one who really doesent care what was more populart where? I grew up enjoying video games that were fun, not whitch console was better. 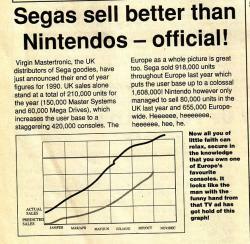 I forgot about that, yeah, there were some surprising sales numbers found for the 7800 consoles. Assuming the SMS numbers are accurate than the 7800 may have outsold it in consoles. They didn't sell many cartridges though, and hardly produced anything more advanced than the 1st gen titles. The SMS had real support with competitive games, and that's what people noticed. Which is why I'm skeptical of posted sales numbers. (Back in the day) 7800 who? I knew of the SMS, NES, Amiga, ST, C64, A8, 5200/2600, Coleco, etc. I never saw one 7800, nor knew it existed, or anything. And yet it out sold the SMS (which every kid I know that played games back then, knew what an SMS was even if they didn't have one)? That doesn't add up. Edited by malducci, Tue Jul 27, 2010 2:14 AM. All I know is that they sold 3.3 million 7800s in the US. I have no idea what the final US numbers for the Master System were. Did you know that Sega offered Atari the Genesis? And the Genesis name apparently originated from Atari? First off, you're awfully angry to be defending a system you admitted you didn't even like!..I'm going to bite, however, as I know you can't get on with your life until you bait me into ending this pitiful 'argument' of yours. Gamers, when given a choice between Sega and NES for straight up, game vs game action, chose the NES. Although not in all cases...especially in cases where your name begins with "The". Really? Really. "The Laird has spoken; The Laird is ready to prove to you all that twenty years ago Nintendo cheated its way to the top and The Laird will prove The Truth relying on two sources! "...my nickname pays hommage to the most important video game system ever created, while you simply tag "The" in front of yours and demand respect. Reminds me of that Seinfeld episode..."I'm The Laird!..and NOOOOO-body beats me!" ...ok, first. That lame 'article'?...looks like the graph came from the back of a Wheaties box and you can tell how scientific and accurate it is by its high tech lack of numerical data! Instead, it relies on some typed bull text above, culminating in all kinds of official sounding jargon such as "heeheeheehee". Bunk, and you should be ashamed to use is as 'evidence'. But it gets better. Wow. I'm not even kidding; that's the title of this book! Now THAT'S a book that's going to offer fair, balanced and non-agenda based truths. Sounds like it was written by some bible-thumping clown who probably thought Pong was a little too violent in the 70's! Here's a tip: people write all kinds of crap to SELL BOOKS (especially to cranky parents who want a reason to blame for Little Johnny's poor grades other than their lack of parenting skills). If Nintendo was/is guilty of such wrong-doings, don't you think that Sega could have hired an arsenal of lawyers and fought tooth and nail against such an 'obvious' manipulator? Oh right...they were too busy advertising on Canadian television... while kids who knew better were busy playing their Nintendo Entertainment Systems. The enslaved children!...whatever shall be done about the ENSLAVED CHILDREN!?!!!?! ...hold the presses, folks: BRAZIL apparently sold more Master Systems than NESs!...how do we know this? Cause a few people here said so?...this entire argument is devoid of reality, folks. The reality is that the reason Master Systems sold well into the 90s while the rest of the world was moving on to N64 and Playstations could very well have been because the majority of people in Brazil couldn't afford new systems! That's not a slam on Brazilians, by the way. I'm sure if the NES was priced to match the SMS early on, it too may have continued to sell. But guess what...they were probably too busy selling new systems to the rest of world, thereby ensuring their business would live on while Sega pulled out after the Dreamcast fiasco! If you're selling 'new' systems at about 20 USD, then of course you're going to sell more...more subpar games! Were these Master Systems even legit machines, or were they cheap knock-offs?...who knows! My simple point is this: history has proven what the 'better' system and company was. You and I may have a disagreement on personal tastes in video games, but the market bears the results: Nintendo for the win! Game per game, you just can't compare SMS to the NES. Yes, Sega had some good games. But not good enough, and they didn't allow third party developers the kind of support they needed to ensure the SMS could be a viable alternative to the NES. The SMS cost more and provided less impressive games from the get-go. Nintendo easily quashed Sega's plans as smart businesses do, but really, they just put out better games. Period. They ensured their third party developers could design top notch games for the NES. Double period.. Nintendo took over because Atari screwed up. Nintendo did not repeat mistakes. It did nothing short of destroy the competition and no, not by some loony theory of shady legal doings, but by providing the MAJORITY of the world with the games that would see Nintendo dominate the video game industry for years to come. Remove your tin-foil hat, The Laird. Turn of your Betamax. If you truly think that some conspiracy transpired to get Nintendo to the top, then obviously you didn't pay attention to the killer app which truly ended the 8 Bit wars before they began: Super F'in Mario Bros. End of story. Now there's a "Game Over" you don't have to search Amazon to find! Please read and understand the following rules. We reserve the right to ban any member who violates our guidelines or disrupts our community. We will be fair and provide warning in most cases. If after being warned a member continues to engage in the behavior he or she was warned about, the member will lose his or her posting privileges. While we understand some discussions can become heated, we will not tolerate members insulting each other in the public forums. Likewise, any racial, ethnic, gender-based insults or other personal discriminations are not permitted. The strength of your arguments goes out the window once you resort to personal attacks. If you find that you often get angry when discussing a certain topic, we suggest you refrain from involving yourself in such discussions. Yes, this thread may have been directed at you but not only did a Moderator ask you/Laird to take it to a seperate thread (Tempest) but there is a lot of valuable information and interesting facts also asked by that moderator from the previous thread. Second, Laird did not post the graph that you are referring to. Please lets keep it to facts.